Welcome back for another round of colourful fun. 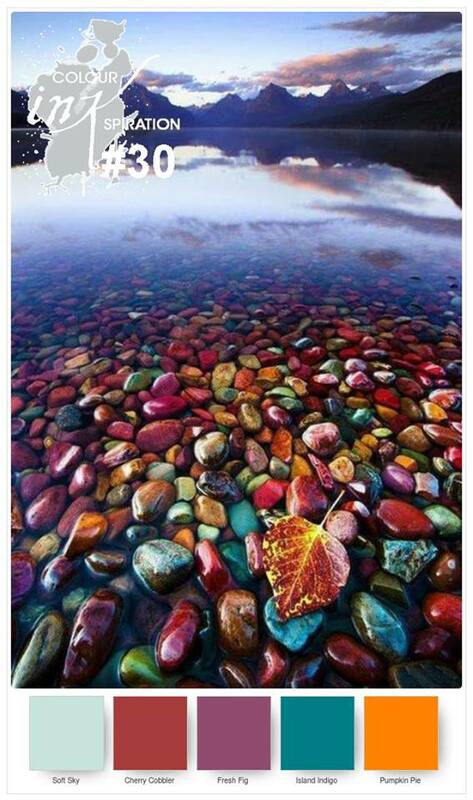 This week's inspiration picture is amazing and the colours are gorgeous but gee I found it hard to get any ideas to work this week! Does that happen to you too? I had loads of ideas that were fabulous in my head but translating those to reality was just elusive this time around. However I'm happy to say that after lots of attempts at various ideas, sticking with it paid off and I am quite happy with the final result. A blend of watercolouring and bokeh techniques, inspired by the ripples in the water in the photo- and the leaf in the foreground. I love the Shimmery white Card for this sort of watercolouring. It's easy to work with. 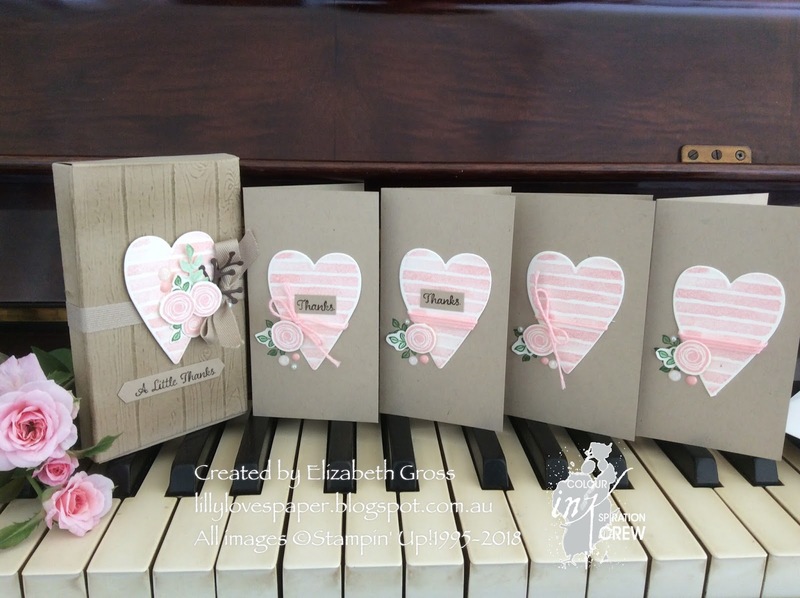 These are all pretty strong colours together so I added only the smallest amount of Cherry by stamping the sentiment and the wee hearts so as not to overpower the piece. I could have used those enamel hearts on everything if there were enough in a pack! The tiny sentiment is from the Tabs for Everything set, it's so elegant. And the hearts are from the new Heart Happiness set. The Bokeh effect with the white Craft Ink does not photograph terribly well but it certainly softens the edges between blocks of colour. I cut the leaf sprays from Indigo and from the Champagne foil and they look lovely together. 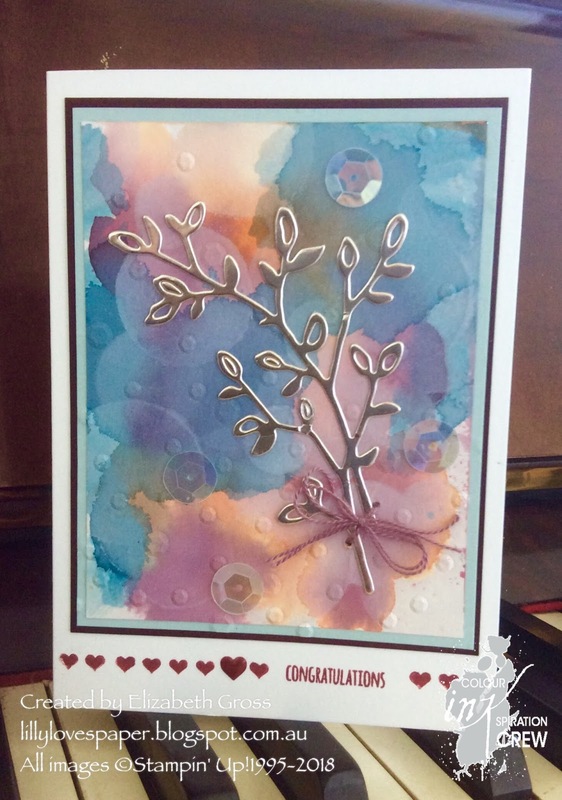 I did also run the layered panel through the sequin embossing folder to help unify the layers. My thread and the large clear sequins are straight from the sewing box (Sadly untouched these days) as I didn't want to mix silver and champagne or coloured sequins. One of my early attempts used the tree rings and more watercolouring. I loved the panels and will come back to this technique with more colours ( and time.......), but I couldn't quite get it to work. 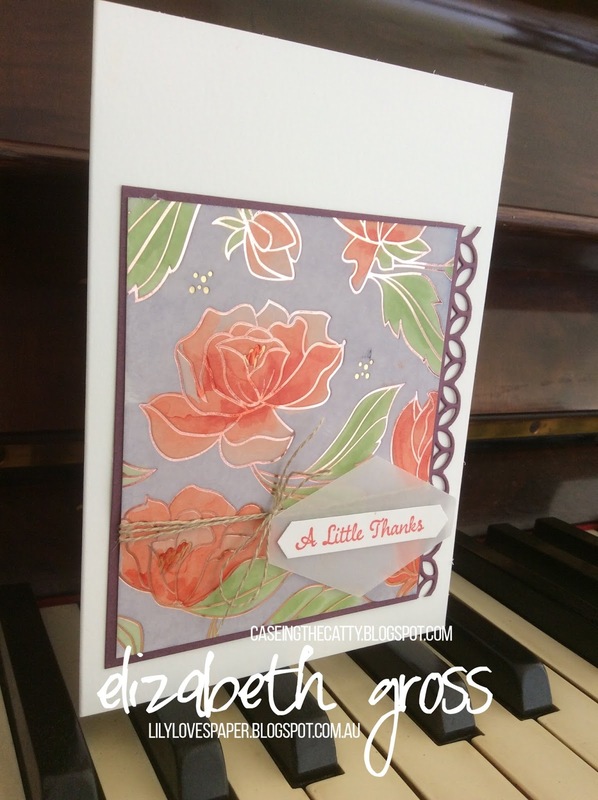 Next this week is Jackie with her gorgeous pocket card. 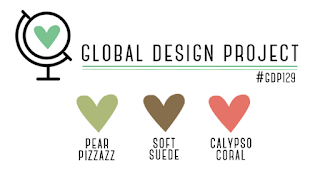 It will be fascinating to see what the team have created using this amazing palette. And don't forget we love to see what you create too. Just post a picture to our Facebook page - you might be our guest designer in the future. 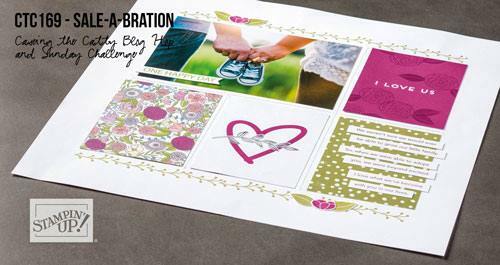 Welcome back to CTC using the Sale A Bration products as inspiration. I am using the gorgeous foil paper again which is just so lovely to colour. I don't know if there is a name for this technique but it's a lot of fun and gives amazing results. The Alcohol ink behaves the same way as the emboss resist technique so that the coloured images don't take any of the water ink. It's a bit scary to swipe the ink over but such a cool result. I have CASED the layout of the card on the front of the brochure. 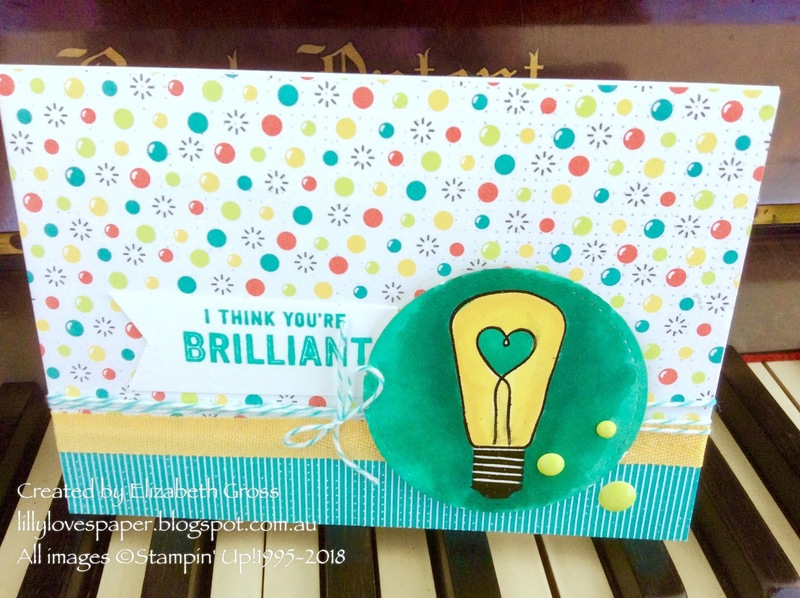 I like the stamped card panel with the thread wrapped around with a vellum shape and the sentiment flag adhered over the vellum. I used the light and dark coral inks and the old olive ( I really hope they bring out another green ) and for the first panel I used the Wisteria Wonder inkpad. For the second card I used the Night of Navy inkpad. - My colouring wasn't quite as exact on this one but I am still getting used to the blends pens. Next this week is Julia. I know she has another lovely project to inspire you. Sadly there's only one more week of Sale a Bration for 2018 so if you would like to get some of this amazing paper for yourself it is free with any purchase of $90. I'd be happy to help you with your shopping if you need some advice, or just click on the shop now rainbow button on the top left of this page. #SU1to3paperchallenge - a great way to use up some gorgeous papers. 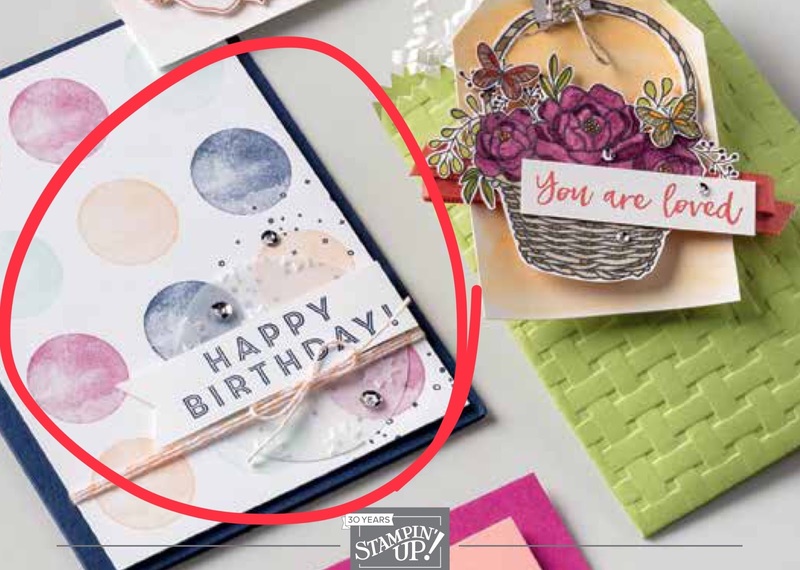 I recently saw an article on the Facebook Stampin' Up! 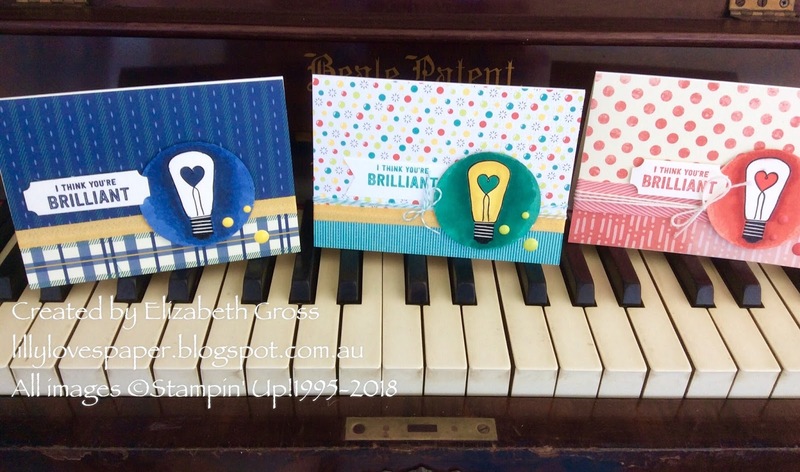 page by Rhoda MacPherson who created 3 cards using lots of DSP. 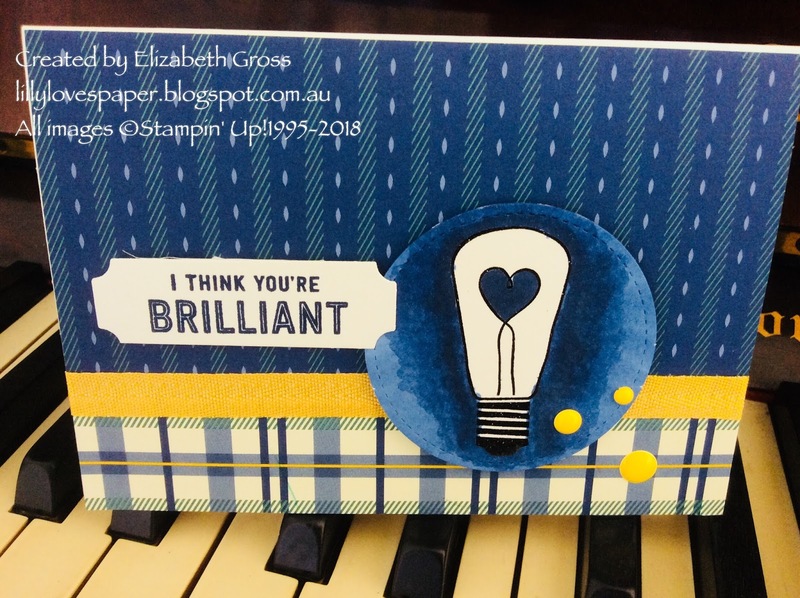 I hope you’ll join in and try a paper challenge of your own. 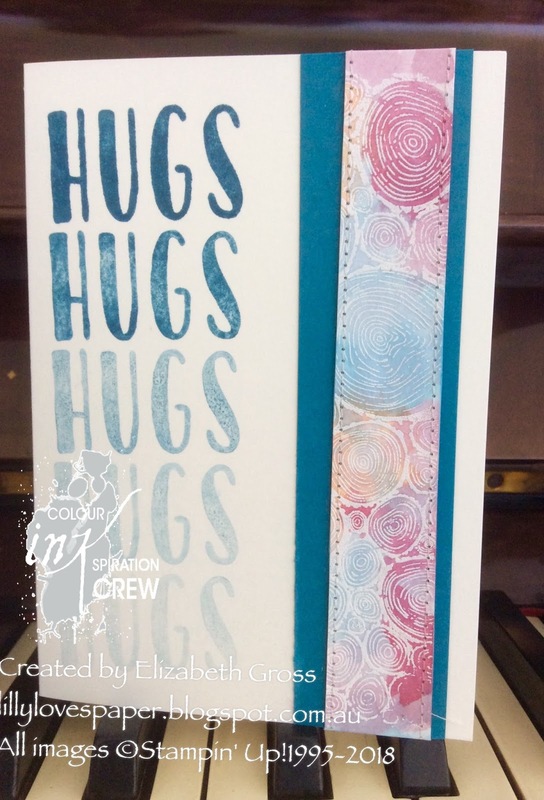 Just use one main stamp set, one basic layout, and three very different papers and see what you come up with! Why not share it with the hashtag #SU1to3paperchallenge so we can check it out and be inspired? So I took the layout from another recent challenge - TGIFC#150 and had some fun creating some different looks. It would be very easy to do this using a flower set for the decor element but I deliberately chose a stamp that could be more widely used... and I love the lightbulbs! I coloured each of the light bulbs using the alcohol blends which was fun, so the colours from the blends guided my paper choices. Some new and some old papers. You'll find the links to each product in the images below for more detail. I will have another set of #SU3to1paperchallenge cards tomorrow for the CASEing the Catty bloghop. Why not see what papers you have that are just asking to be made into a neat 3 for 1 challenge too. 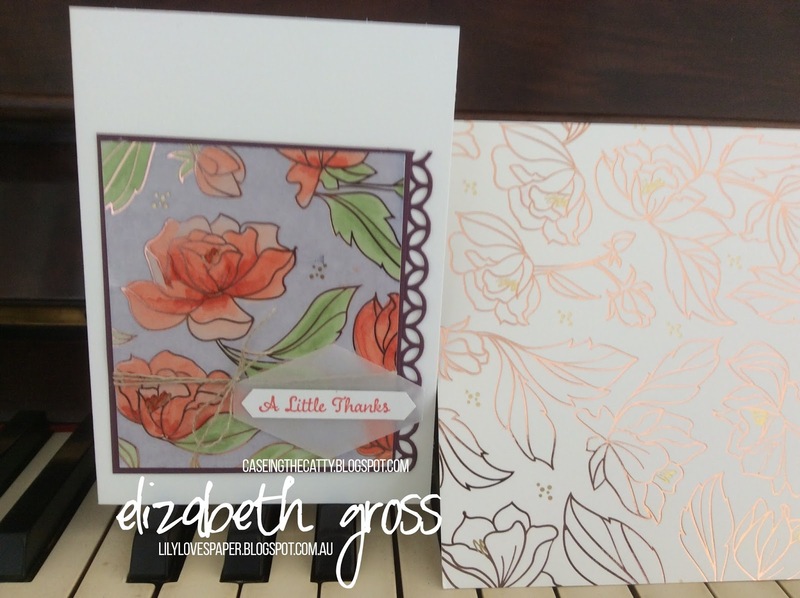 I have so much gorgeous paper and love it when a challenge prompts me to use larger pieces. This paper is retired but I loved it so much I still have a few sheets- saving them for something special ( I know you know what I mean). 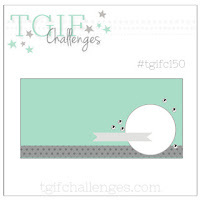 The sketch from TGIFC this week #150 is perfect for using up paper. I didn't have much Soft Suede in DSP but I think the wood grain works well with the floral paper. I'm so excited the wood grain paper will be continuing on in the next annual catalogue- it's been so popular universally. The amazing you Sale A Bration set won't be around for much longer but it is such a gorgeous flower. 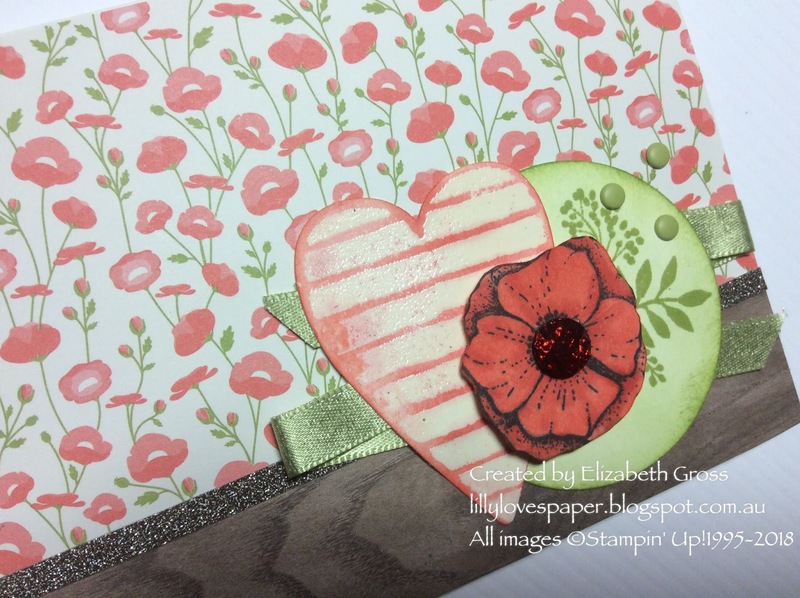 I heat embossed the heart with clear powder onto vanilla and then coloured the heart with watercolour Coral. Thanks so much for stopping by today. I will have more cards using this great layout to share soon. 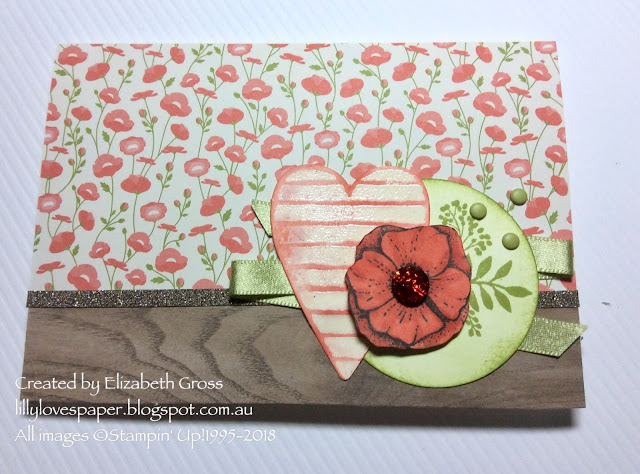 Welcome back for another bloghop using this fortnight's Colour INKspiration colour combination. I could have seriously made quite a few different projects using this gorgeous set of colours. 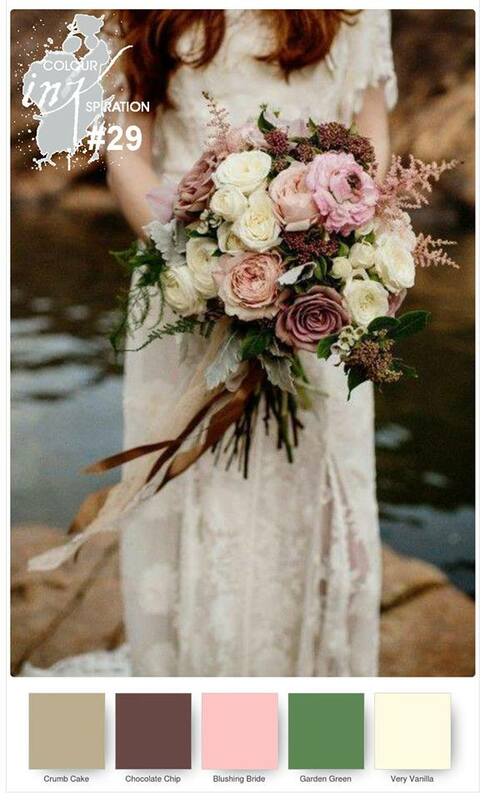 The inspriation picture with all those gorgeous roses and lace is just so feminine. I have been trying to find some time to use my new Lots to LOVE thinlits for the wee box- and it's honestly the easiest box to put together. I was delighted with how fast it was to create. I included a little set of 4 notecards- 2 say thanks and 2 are plain, and the baker's twine treatment is a little different too. I ran the front piece of the box - but not the flap, through the wood planks EF and then lightly sponged some Crumb Cake ink over the panel. I love the crumb cake ribbon and it worked well after I discovered that I have actually run out of lace - not even sure how that happens. 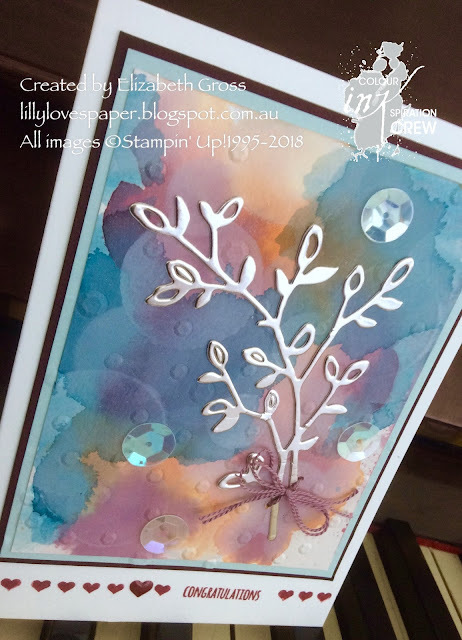 The little roses are from Swirly Bird, and I snuck in a bit of Early Espresso wiht the text stamping and the sprig in the bouquet - a bit like the photo. As a nice little link the mini pink roses are from my garden - it's a Cecile Brunner rose bush and they bloom despite my lack of skill. We had one of these bushes in the home where I grew up as they were the flowers on my parent's wedding cake. They bloomed every year for their wedding anniversary and were a regular feature on cakes for their anniversary and my birthday. The 4 cards and envelopes fir perfectly in the box. 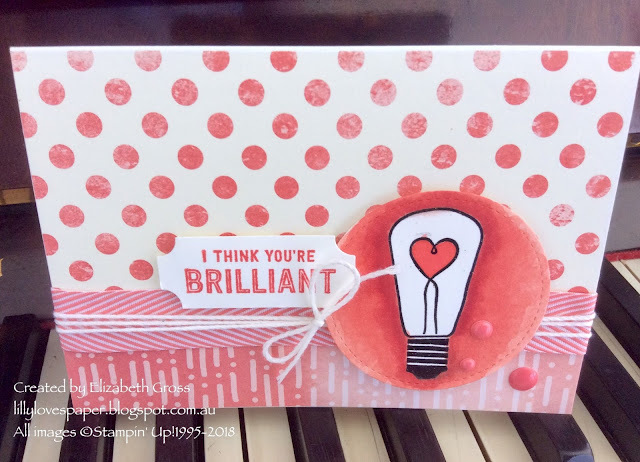 And I have to confess that I bought the Heart Happiness stampset purely for the large heart- it was so worth it, look at all that delicious texture with just one inkpad. So thankyou for hopping along today, there is such a lot of gorgeous inspiration as you go around the design team. Enjoy it. And don't forget we love to see what you create using the same colours. You have 2 weeks to get a photo of your project up on our Facebook page.